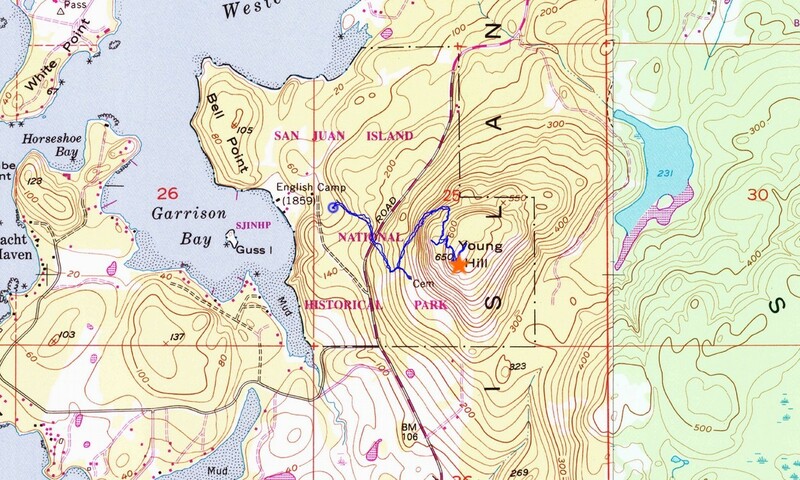 Young Hill is the a nice hike, and the highest public access point on San Juan Island, the second largest and most populous island of Washington’s San Juan Islands archipelago. There are a couple other higher points that are on private property. The summit is a commanding position to take in the views of the ocean and surrounding terrain. It’s a nice hike, which offers up some great history to learn along the way. My family and I visited Young Hill during a summer road trip. We parked at the lower trailhead at English Camp. The trail is popular and well maintained, making its way up through the forest, crossing the highway, and then more forest. The trail was moderately steep in places, and we rested occasionally, posing for pictures on rocks, logs, etc. My wife stopped to inspect several madrone trees along the way. She was fascinated by the red bark. The summit views were nice, and we were joined by a couple local gals who had taken a cross-country route up. After some photos, we retraced our path back down, including more posing for photos and a quick stop to check out the historic English cemetery nearby. Once back to the car, it was time to hit the road to Lime Kiln Point State Park to try and spot some orcas. Map of the route, just over 2 miles and 500' gain round trip. Studying the map at the English Camp trailhead. Tree posers on the way back down.